Ratio of: "Heard By" to "Hearing"
I live in Hawaii, which is about 3000 miles from any other place on earth. Generally I am on 30 meters, running 5 watts. 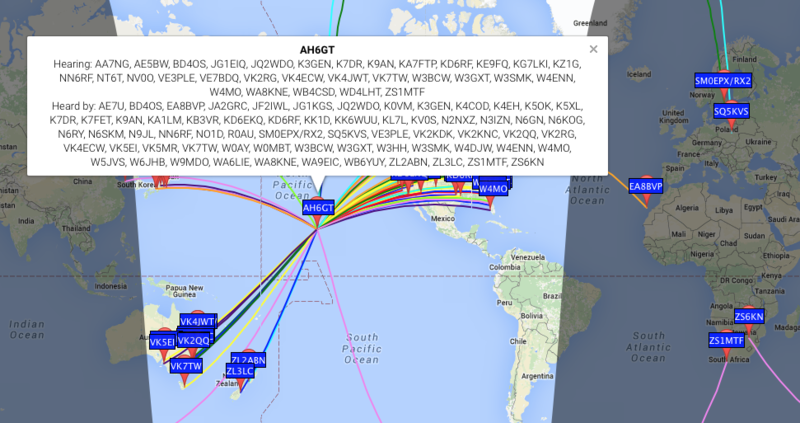 I have been very happy using WSPR for many months. Tthis week, I suddenly realized that the number of stations I am hearing is consistently about 1/6 the number of stations that are hearing me! I have noticed on the map that some stations have a very high ratio one way or the other, and that some stations are about 1 to 1. Many stations simply monitor and do not transmit. But how many? Is there a way to find out? My local power company has some 3-phase high voltage lines running north-south in front of my home. I am using a 52 ft. G5RV Jr mounted about 30 feet over my metal roof. I consistently have a noise floor between 4 and 7 S units on my TS-590S. Or I need a bigger antenna... don't we all?